BYOB - around here that stands for Bring Your Own Base-Layer, and Scorpion has joined the movement with the all new Yukon jacket and pants. 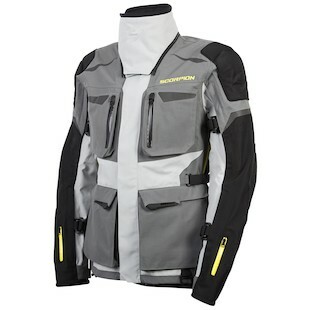 Scorpion is not treading lightly into the world of ADV touring gear as they introduce the Scorpion Yukon Jacket that comes ready for action with a fully waterproof, seam-sealed outer shell, with 1680D Nylon and SAS-TEC armor at high impact areas, included CE back and chest armor, and a full system venting scheme that makes this jacket and pants combo a serious contender. 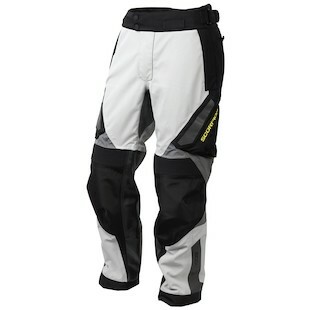 There are plenty of high-end features that set this gear apart; waterproof pockets with poly-coated YKK zips, leather inner frame grip panels, and a tremendous amount of adjustability throughout the jacket and pants. Like most of the top-end adventure riding gear on the market, the Yukon forgoes integrated thermal and waterproof layers, and allows the rider to customize the internal layering to suit. No two riders are the same, and now you can customize the thermal and windproofing properties of your layers to create the perfect jacket. The Yukon even looks good - I am a huge fan of the battleship-ish gray finish. To round out the ensemble, the Scorpion Yukon Pants work as the bottom half to give riders a completed, all-weather defensive strategy. Constructed of the same materials as the accompanying jacket, you can motor on knowing that Scorpion has thought of everything to keep you going, come what may, along the greatest treks of the season. Built with an 8”, YKK connection zipper that creates a linkage between the trousers and jacket, there is no end to where the Yukon lineup can accompany you. The Yukon jacket and pants prove that Scorpion is ready for the challenge of multi-disciplined riding; at $549 for the jacket and $359 for the pants, you can be completely outfitted for less than some jackets. Well played, Scorpion.